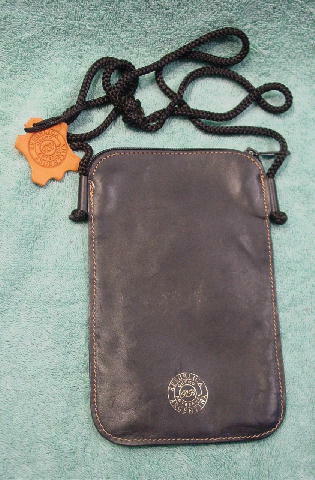 This black vintage leather purse was made and purchased in Argentina. 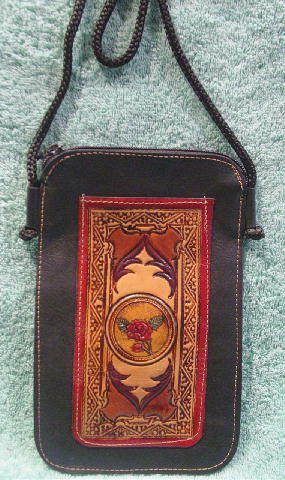 The back is plain and the front has a leather pocket with a tooled design in red, green, and various shades of brown. There is a top side to side zipper opening with a black cord 64" by 1/4" shoulder strap which has a tan leather tag attached with Republica Cuero Artesanal Argentina etched within a circle. The back has the same circular stamp in gold letters.